Party season has arrived (hooray! ), so it's time to up my skincare game. During December my usual pre-sleep cleanse doesn't cut the mustard. The late nights, back-to-back parties, cold weather and weekday boozing leave my complexion dull, blotchy and spotty. 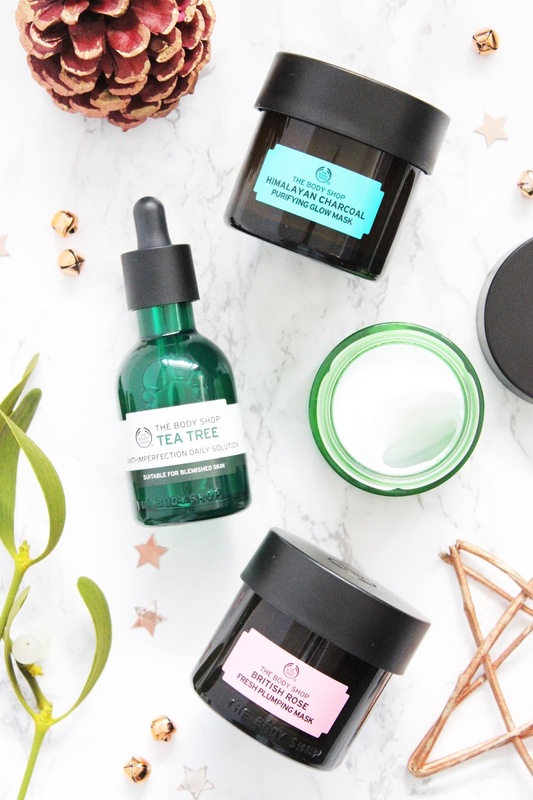 So I've put together a whole host of effective skincare products from The Body Shop, to help prep and preen my skin for the party season. It probably is no surprise that you’ve got to start by cleansing the skin. I tend to double cleanse every evening as I work in the city and wear makeup regularly. For the initial cleanse I will use a basic no-fuss cleanser such as The Body Shop Camomile Silky Cleansing Oil £12.00 to remove makeup and surface grime. And then I'll use a targeted cleanser (i.e. for dry or congested skin) for a deeper clean. Next I'll scrub-a-dub-dub. Exfoliation is key for glowing skin, as when old skin cells start to pile up, your complexion can become rough, dull and clogged. My polish pick is The Body Shop Tea Tree 3-in-1 Wash Scrub Mask £8.50, the grainy scrub contains tea tree oil (an ol' faithful of mine that treats without over-drying) and tiny exfoliating particles that gently unclog blocked pores, smooth the top layer of the skin and reduce the appearance of those unsightly blackheads. I recommend exfoliating 1-2 times a week, applying the scrub to damp skin in circular motions and tailoring the pressure to your skin. My favourite skin-boosting treatment pre-party is a mask. If you suffer from blemish prone skin, or have spots that like to linger, I recommend using a clay based purifying mask to help lift out impurities and speed up the healing process. I love The Body Shop Himalayan Charcoal Purifying Glow Mask £17.00, formulated without any nasties it helps clear congested skin. I apply generously ideally using a Facial Mask Brush £8.00, let it set and then use a warm flannel to remove every last morsel. And for those mornings of a party when I wake up with a throbbing spot (typical), I use the clay mask directly onto the spot with a cotton bud and leave it to work as long as possible. Whenever I use a purifying mask I always like to follow up with some facial oil to rehydrate the skin. The Body Shop Drops Of Youth™ Concentrate £26.00 is packed with several do-good ingredients that help to soften the skin and prevent moisture loss. It sinks in nicely with a little facial massage and by morning (as I prefer to apply oil in the PM) it's soothed away red patches and left my skin plump and glowy. And if my complexion is freaking out I'll use The Body Shop Tea Tree Anti-Imperfection Daily Solution £13.00, pre-serum/oil concentrate that combats blemishes. If you're looking for a mask to hydrate, plump and soothe The Body Shop British Rose Fresh Plumping Mask £17.00 is a great pick. It's infused with real rose petals, rosehip oil and aloe vera and is perfect for dry and sensitive skin. As a last-minute quick fix, apply the mask 30-60 minutes before you apply your makeup for gorgeous dewy skin. Skincare is truly the first step in applying makeup. So for the perfect canvas I always moisturise, as dehydrated skin shows all the lines, can aggravate blemishes and leave it looking dull and flaky - not desirable. I'm currently enjoying The Body Shop Drops Of Youth™ Cream £22.00 (which fyi smells heavenly) and leaves my skin smoother, more luminous and awake - very desirable. Just make you wait five minutes before you apply your foundation to prevent a messy make-up slip 'n' slide. What products do you reach for to prep your skin for the party season?